The Liberty PRIME microwave peptide synthesizer is a cutting-edge instrument for peptide synthesis. By using a new one-pot coupling and deprotection method for solid phase peptide synthesis it considerably diminishes cycle time and waste usage down to revolutionary levels. The cycle time of the system is only 2 min 10 sec (for all 20 standard Fmoc amino acids) with only 8 mL of chemical waste generated, half the amount of CEM's very efficient Liberty Blue peptide synthesizer. The Liberty PRIME is an ideal system for high throughput peptide synthesis of both standard and complex peptides. It can automatically synthesize up to 24 peptides in one day. Traditional solid phase peptide synthesis uses iterative and separate deprotection and coupling with washing between these steps. This assumed that undesirable amino acid insertions can occur without complete draining and washing between each step. Research by our scientists in 2013 showed that removing the washing after the coupling step does not adversely affect the peptide purity.1 The Liberty PRIME takes this to the next level by using a new one-pot coupling and deprotection process as shown in Figure 1.2 In this procedure, the deprotection reagent (base) is added directly to the undrained post-coupling mixture. This is based on the insight that faster reaction kinetics in the solution phase promote rapid hydrolysis or self-condensation of the active ester, thus preventing potential side reactions at the resin bound amino functionality. The Fmoc removal then proceeds uninterrupted at elevated temperature. Optimizing the use of reagents results in an essentially neutral reaction mixture towards the end of deprotection step. This has many advantages such as (a) approximately 90% reduction in solvent requirement for the deprotection step, (b) 75% reduction in solvent requirement for post-deprotection washings, (c) faster deprotection step since the microwave ramp time is not needed, and (d) shorter cycle time due to absence of post-coupling drain step. To use the one-pot coupling/deprotection method one needs to constantly add precise small volumes of concentrated base. To achieve this, the Liberty PRIME incorporates a new dedicated pumping module with the ability to rapidly add the deprotection reagent exactly at the end of the coupling step in volumes down to 0.25 mL. The precalibrated pump module does not require on-going calibration thereby avoiding drifting delivery amounts. In addition, the main wash and the activator (Oxyma Pure) are also delivered through similar individual pumps within the module to improve performance. The Liberty PRIME also utilizes the CarboMAXTM coupling process that improves existing carbodiimide chemistry at elevated temperature by using a higher ratio of carbodiimide relative to the amino acid (2 equivalents).3 This coupling chemistry has demonstrated the ability to provide a more rapid formation of the O-acylisourea intermediate thus leading to faster coupling rates while correspondingly reducing epimerization.4 Highly efficient 1 minute coupling times on the Liberty PRIME utilizing CarboMAX chemistry at 105 °C provides exceptional acylation rates with minimal epimerization rates for all 20 standard Fmoc amino acids (including cysteine and histidine). A selection of well-known difficult peptides were synthesized to demonstrate the performance of the Liberty PRIME automated microwave peptide synthesizer. All Fmoc amino acids were obtained from CEM Corporation (Matthews, NC) and contained the following side chain protecting groups: Arg(Pbf), Asn(Trt), Asp(OMpe), Cys(Trt), Gln(Trt), Glu(OtBu), His(Boc), Lys(Boc), Ser(tBu), Thr(tBu), Trp(Boc) and Tyr(tBu). 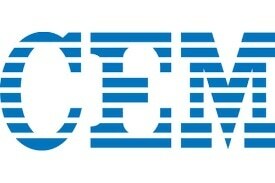 Oxyma Pure and Rink Amide ProTideTM LL resin were also obtained from CEM Corporation (Matthews, NC). Rink Amide MBHA LL and Fmoc-Gly-wang LL resins were obtained from MilliporeSigma (Burlington, MA). N,NDiisopropylcarbodiimide (DIC), Pyrrolidine, Trifluoroacetic acid (TFA), 3,6-Dioxa-1,8-octanedithiol (DODT), Triisopropylsilane (TIS) and acetic acid were obtained from Sigma-Aldrich (St. Louis, MO). Dichloromethane (DCM), N,N-dimethylformamide (DMF), and anhydrous Diethyl ether (Et2O) were obtained from VWR (West Chester, PA). HPLC-grade water (H2O) and HPLCgrade acetonitrile (MeCN) were obtained from Fisher Scientific (Waltham, MA). All peptides were synthesized on a Liberty PRIME system (CEM Corp.) at 0.10 mmol scale using CarboMAX coupling with one-pot coupling and deprotection. Coupling with Fmoc-AA-OH/DIC/ Oxyma (5/10/5) in DMF was performed for 60 sec at 105 °C. The deprotection step was initiated by adding 0.5 mL of 25% pyrrolidine/DMF directly to the undrained post-coupling solution and the reaction was continued for an additional 40 sec at 100 °C before draining. This was followed by a single 4 mL wash. Cleavage was performed for 30 min at 40 °C using the CEM Razor high-throughput peptide cleavage system with TFA/ H2O/TIS/DODT. Following cleavage, peptides were precipitated in cold Et2O and lyophilized overnight. Crude peptides without any purification were analyzed on a Waters Acquity UPLC system with PDA detector equipped with an Acquity UPLC BEH C8 column (1.7 mm and 2.1 x 100 mm). The UPLC system was linked to a Waters 3100 Single Quad MS for structural determination. Peak analysis was performed on Waters MassLynx software. Separations were achieved with a gradient elution of 0.05% TFA in (i) H2O and (ii) MeCN. The one-pot coupling/deprotection process on the Liberty PRIME produced high purity peptides and reduced the cycle time by 50% and the amount if chemical waste by 66% compared to the ordinary methods utilized on CEM’s Liberty Blue automated microwave peptide synthesizer. A typical cycle at 0.10 mmol scale on the Liberty PRIME uses a single wash of 4 mL between the deprotection and subsequent coupling, and produces only 8 mL of chemical waste with a total cycle time of 2 min 10 seconds. Table 1 shows the experimental data in terms of crude purity, total synthesis time and total chemical waste for a set of eight peptides synthesized on the Liberty PRIME. The potential for epimerization was then studied with the elevated temperature coupling methods used on the Liberty PRIME. Especially cysteine and histidine are known to be sensitive to epimerization during coupling. Hence the epimerization level was examined through a classic method involving hydrolysis, subsequent derivatization, and gas chromatography analysis (C.A.T. GmbH). As shown in Table 2, epimerization levels observed with HBTU/DIEA activation at room temperature were found to be higher than those from 90 °C standard or CarboMAX couplings as well as from 105 °C CarboMAX coupling on the Liberty PRIME. Use of Fmoc-His(Boc)- OH instead of Fmoc-His(Trt)-OH allowed coupling temperatures of 90 °C or 105 °C without any increase in epimerization levels. These results show that standard HE-SPPS or CarboMAX coupling methods are especially useful for peptide synthesis at elevated temperature. The one-pot coupling/deprotection procedure used on the Liberty PRIME automated microwave peptide synthesizer enabled a broad range of peptides to be synthesized extremely efficiently. A standard cycle with the improved CarboMAX coupling chemistry was used for all 20 amino acids (including cysteine and histidine). This greatly simplifies the need for sequence based optimization. 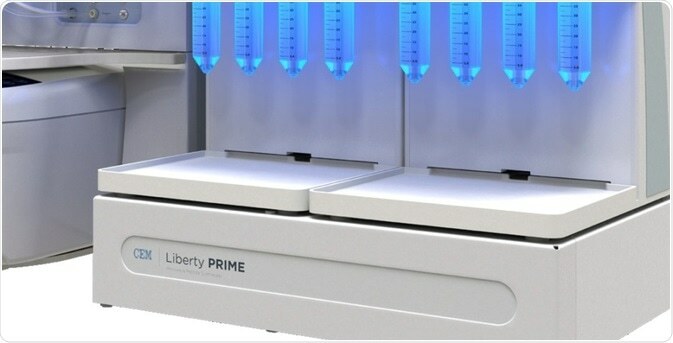 The Liberty PRIME with its standard 2 minute cycle time is perfect for high-throughput peptide synthesis of both standard and complex peptides with an unmatched decrease in chemical waste. (1) J. Collins, K. Porter, S. Singh and G. Vanier, “High-Efficiency Solid Phase Peptide Synthesis (HE-SPPS),” Org. Lett., vol. 16, pp. 940-943, 2014.